Malic Acid, Citric Acid, Natural And Artificial Flavors, Calcium Silicate, Sucralose, FD&C Yellow #5, FD&C Blue #1. Citric Acid, Silicon Dioxide, Natural & Artificial Flavors, Malic Acid, Sucralose, Acesulfame Potassium, FD&C Red #40. Citric Acid, Natural & Artificial Flavors, Malic Acid, Sucralose, Acesulfame Potassium, Silicon Dioxide, FD&C Blue #1. 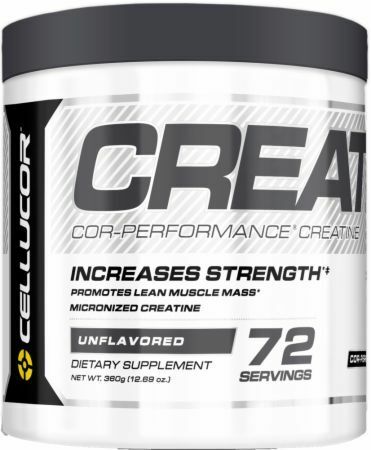 Mix one to two scoops of Cellucor COR-Performance Creatine in 8-10 oz. of juice, water or other beverage of your choice, and consume 30 minutes prior to training, or in the morning on non-training days. (For maximum results) Begin with a loading phase of four servings per day for the first five days of product use. 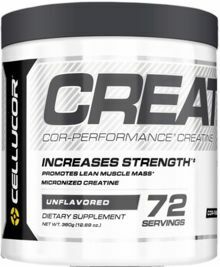 MAXIMUM PERFORMANCE TIPS: Drink immediately after mixing as certain ingredients in Cellucor's COR-Performance Creatine may be prone to settling. Drink 8-10 glasses of water daily. Mix Cellucor with juice or flavored sports beverage of choice. For maximum results, combine with Cellucor C4 Extreme and/or Cellucor COR-Performance Whey Protein. This product is only intended for use by healthy adults, 18 years of age or older. Not for use by women who are pregnant or nursing. Do not use this product if you have or suspect you have a medical condition, including but not limited to diabetes or kidney disease, or if you are taking any prescription or over-the-counter medication. Consult a health care professional before using this or any dietary supplement product. Discontinue use and call a health care professional immediately if you experience any adverse reaction to taking this product. Follow label instructions and do not exceed recommendations for Suggested Use. KEEP OUT OF REACH OF CHILDREN. Store in a cool, dry place. The Cellucor COR-Performance Series features premium, innovative formulas you expect from Cellucor in an all-new line up of commodity sports nutrition products. Featuring clinically dosed formulas and unmatched flavor systems, the COR-Performance series is designed to satisfy every customer: great formulas, great flavors and great prices. The entire line is GMP and Informed-Choice certified and sports a fully disclosed TruFacts label.